This summer Priit Kallas is defending his master’s thesis, entitled “Probabilistic Localization of a Soccer Robot“, where he describes how he implemented reliable localization on a soccer robot “Telliskivi II”, who got a second place in Robotex 2012 (the name stems from the fact that two core members from the Telliskivi team participated in its creation). A short article somewhat mentioning Telliskivi, entitled “A simple formula for building a robot” has been published in this month’s Arvutimaailm magazine. To summarize it in three sentences, the article says: “Robotics is fun. In order to build a robot you need to work on mechanics, electronics and programming. Everyone should do Robotics!“. The object detection techniques described in the previous post work fairly well in a wide range of situations except when our robot is standing right in front of the field border. 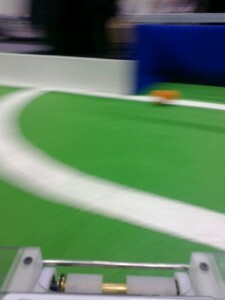 Field borders are ~10cm high white “walls” and when one of those is directly in front of the robot, the effect is that the whole lower part of the camera image is basically white. This confuses our border locator and everything beyond the wall starts getting recognized as being actually within the playing field. Instead of improving the border locator to deal with that, we added a simple “wall proximity detector” module, which would recognize the situation described above and report it in a binary flag. The information about such a “wall proximity” condition is then accounted for in the ball- and goal detector modules (there is basically a condition which says “if we bumped into the wall then everything further away than 10-20cm is not interesting”). In addition, the “wall proximity flag” is used in the behaviour algorithm – getting stuck bumping into the wall is certainly a condition that we want to avoid. Detecting the wall proximity condition is fast and easy. To perform it, we simply need to make sure that a certain fixed region of the image is nearly all white. We do that by sampling 100 pixels from that region randomly and if 95 or more of them are white we declare that we are probably bumping into a wall. 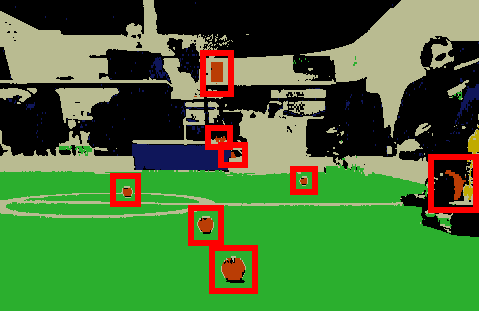 In fact, we perform this procedure for three different regions – the “very close” region at the bottom of the frame, the “fairly close” region above it, and a third region yet higher above, where we look for yellow or blue pixels – this lets us detect a situation where we are in danger of driving directly into a goal (which would be a violation of Robotex rules). The vertical position of the three detection regions depends slightly on the angle of the smartphone. To account for that, we have a simple calibration routine, which detects the vertical coordinate at which our robot’s front edge is located on the image and adjusts the region positions accordingly. It must be said that, despite the simplicity of the approach, it has been an enormously useful solution. Most of our initial attempts of implementing smart steering (i.e. avoiding getting stuck near the wall or driving into a goal) were often either inefficient or prone to errors in borderline cases. The simple idea of making the robot “get scared” of seeing large regions of white in front of him, however, tackled most of the complicated cases unexpectedly well. 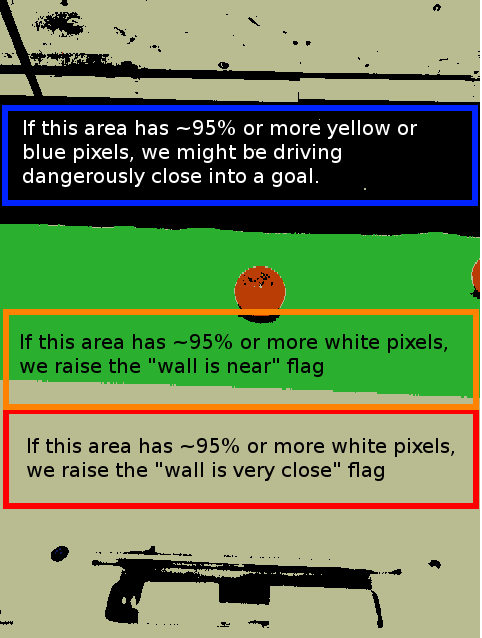 Knowing that a certain orange blob on the picture corresponds to a ball does not help us much unless we know how to drive in order to reach it. 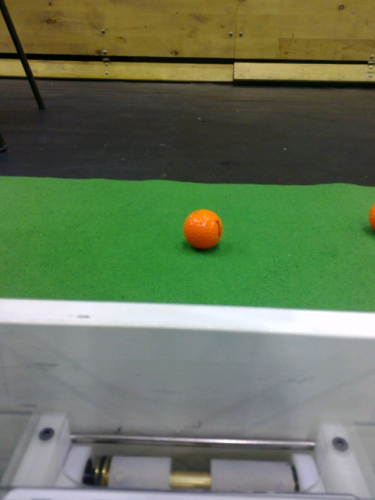 In order to be able to do that, we must compute where exactly this ball is located with respect to the robot. 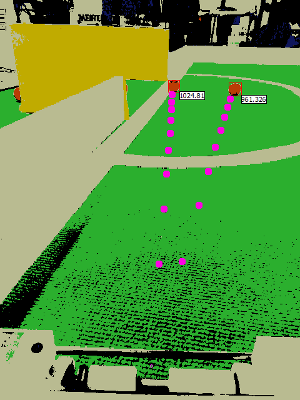 Thus, the second important basic component of our vision subsystem (after the color recognition/blob detection module) is the coordinate mapper. We shall assign coordinates to the points of the field. Coordinates will be local to the robot (we shall therefore refer to them as “robot frame coordinates“). That means, the origin of the coordinate system (the point (0, 0), red on the image above) will will be fixed directly in front of the robot. The point with coordinates (300, 200) will be 300mm to the right and 200mm to the front (the blue point on the image above), etc. With the coordinate system fixed, each pixel on the camera frame uniquely corresponds to a point on the field with particular coordinates. The task of the coordinate mapper is to convert from pixel coordinates to robot frame coordinates and vice-versa. I will not bore you with the proof of this fact. 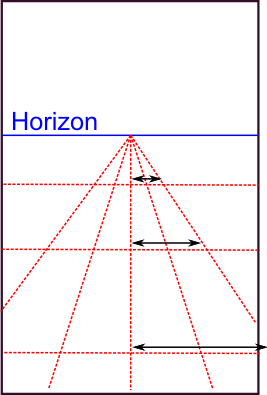 If you are really interested, however, you should be able to come up with it on your own after reading a bit about the pinhole camera model, the perspective projection, and meditating on the following figure (here, p is the pixel vertical coordinate as counted from the horizon line and d is the actual distance on the ground). Finding the X coordinate (i.e. the distance “to the right”) is even easier. 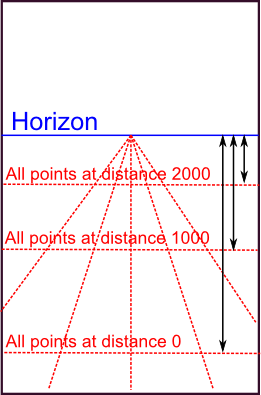 Note that as you approach horizon, the pixel-width of a, say, 100mm segment, decreases linearly. where C is some constant again. Once we’re done with the math, we need to find the constants A, B, C as well as the pixel coordinate of the horizon line to make the formulas work in practice. 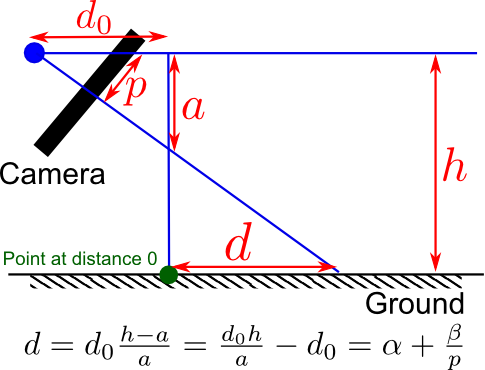 Those constants depend on the orientation of the camera with respect to the ground, i.e. the way the camera is attached to the robot. For robots that have their cameras rigidly fixed it is typically possible to compute those values once and forget about them. Telliskivi’s camera, however, is not rigidly fixed, because the smartphone can be taken out from the mount. Thus, every time the phone is repositioned (or simply nudged hard enough to get displaced), we need to recalibrate the coordinate mapper by computing the A, B and C values, corresponding to the new phone orientation. To do the calibration, we need to “label” some pixels on the screen with their actual coordinates in the robot frame. 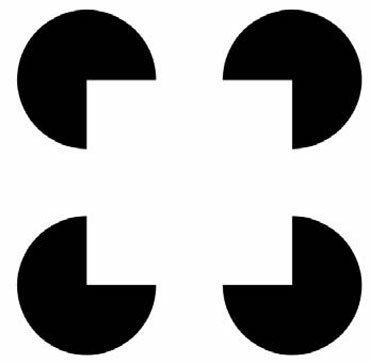 The easiest approach for that is to lay out a checkerboard pattern (or any other easily detectable pattern) printed on a piece of paper in front of the robot. After that, a simple corner detection algorithm can locate the pixels, which correspond to the four corners of the pattern. 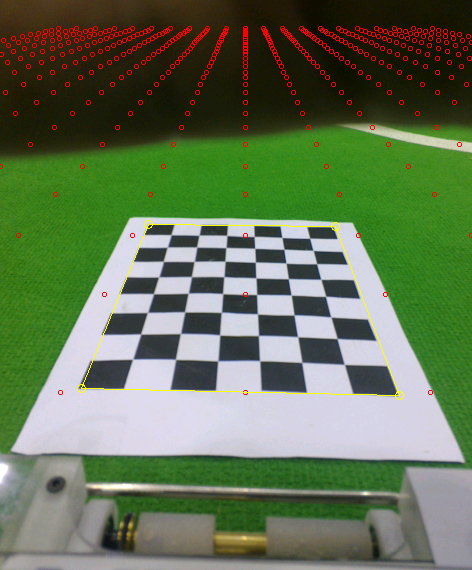 As the dimensions of the pattern are known and it is laid out at a fixed distance from the robot’s front edge, the actual coordinates, corresponding to the corner pixels are also known. Hence, putting those values into the equations above lets us compute the suitable values for the A, B and C constants and this completes the calibration. 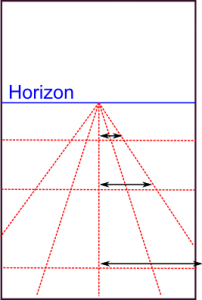 It is worth keeping in mind that due to the properties of perspective projection, coordinates of faraway objects computed using the formulas presented above can be rather imprecise. Indeed, for objects further than 3-4 meters, an error by a single pixel can correspond to a distance error of more than 20 cm. Such pixel errors, however, happen fairly often. 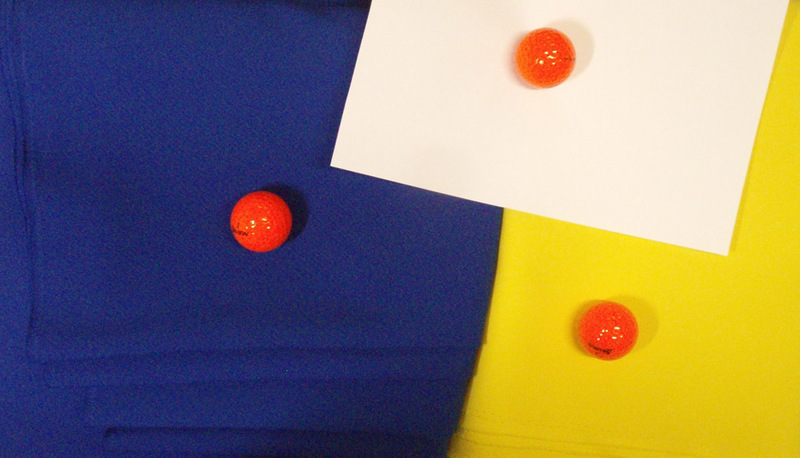 For example, a shadow may confuse the blob detector to not include the lower part of a ball into the blob. Alternatively, the robot itself may tilt or vibrate due to the irregularities of the ground – this shakes the camera and shifts the whole picture by a couple of pixels back and forth. Luckily, this discrepancy is usually not an issue as long as our main goal is chase balls and kick them into goals. 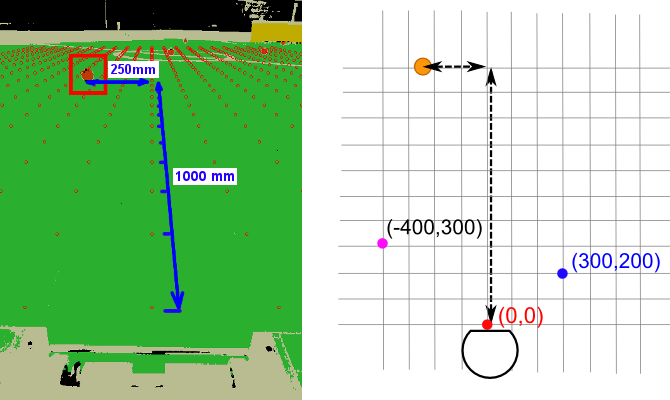 If better precision for faraway objects were necessary, however, it would be possible to achieve by carefully tracking the objects over time and averaging the measurements. // of a predefined pattern lying in front of the robot. // (you've seen it on the pictures above). bool failed() const;                   // Was detection successful? Now that we are done with the hardware details, let us move to the “brain” of the Telliskivi robot – the software, running on the smartphone. By now you can safely forget everything you read (if you did) about the hardware, and only keep in mind that Telliskivi is a two-wheeled robot with a coilgun and a ball sensor, that can communicate over Bluetooth. sense – returns 1 if the ball is in the detector and 0 otherwise. (*Actually, things are just a tiny bit more complicated, but it is not important here). We now add a smartphone to control this plaform. 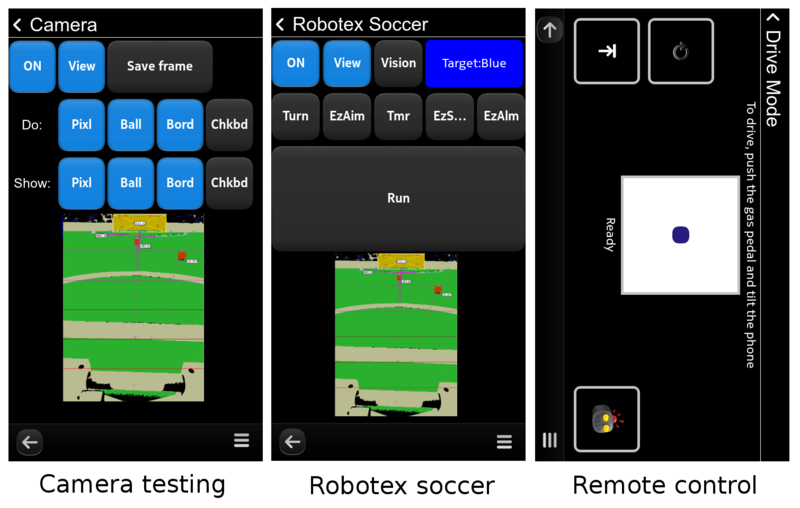 The phone will use its camera to observe the surroundings and will communicate with the platform telling it where to go and when to shoot in order to win at a Robotex Soccer game. The Robot Controller is a module (a C++ class) which hides the details of Bluetooth communication (i.e. the bluez library and the socket API). The class has methods which correspond to the Bluetooth commands mentioned above, i.e. “speeds(a,b)“, “charge()“, “shoot()” and “sense()” and “discharge()“. In this way the rest of the system does not have to know anything at all how exactly the robot is controlled. For example, a simple change in this class lets us use the same software to control a Lego NXT platform instead of Telliskivi. That platform does not have a coilgun nor a ball sensor (hence the shoot(), sense() and discard() methods do not do anything), but it can move in the same way, so if we let our soccer software run with the NXT robot, the robot still manages to imitate playing soccer – it would approach balls and desperately try to push them towards the goal. Looks funny and makes you wonder whether it is polite to laugh at physically disabled robots. Obviously, the robot controller is the first thing we implemented. We did it even before we had Telliskivi available (we could use the Lego NXT prototype at that time). The GUI is the visual interface of the smartphone app. Ours is written in QML, a HTML-like language for describing user-interfaces. Together with the Qt framework this is the recommended way of making user applications for Nokia N9. It takes time to get used to, but once you grasp it, it is fairly straightforward. The overall concept of our UI is not worth delving deeply into – it is just a bunch of screens organized in a hierarchical manner. 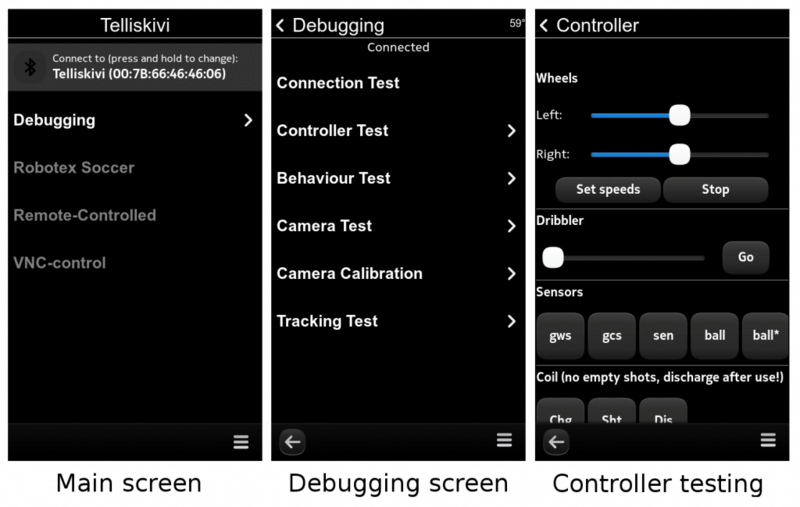 Most screens are meant for debugging – checking whether the Bluetooth connection works, whether the robot controller acts appropriately, whether the vision system detects objects correctly, and whether the various behaviours are behaving as expected. 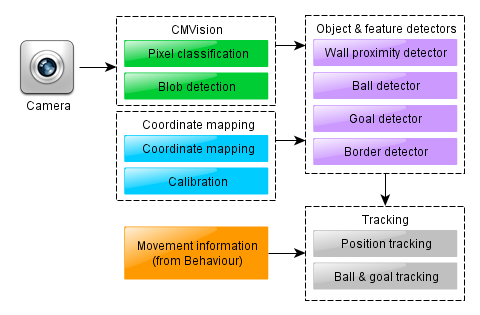 The vision processing sybsystem is responsible for grabbing the frames from the camera (using QtMultimedia), and extracting all the necessary visual information – detecting balls, goals and walls. In our case, parts of the vision subsystem were also responsible for tracking the robot’s position relative to the field. Thus, it is a fairly complex module with multiple parts and we shall cover those in more detail in later posts. The last part is responsible for processing vision information, making decisions based on it, and converting them into actual movement commands for the robot – we call it the “behaviour controller”. In a later post we shall see how depending on the choice of representation of the “goal”, this generic approach can result in behaviours ranging from a simple memoryless single-reflex robot, to somewhat more complex state machines up to the more sophisticated solutions, suitable for the actual soccer-playing algorithm. As you might guess, all of our robot’s software was written by us from scratch. This is a consequence of us being new to the platform, the platform being new to the world (there is not too much robotics-related software pre-packaged for N9 out there yet), and the desire to learn and invent on our own. However, it does not mean that everyone has to write things from scratch every time. 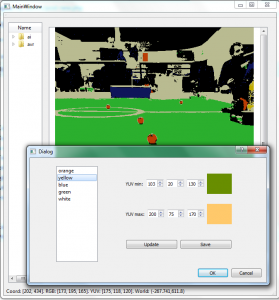 Of course, there is some good robotics software out there to be reused. Perhaps the most popular system that is worth knowing about is ROS (“Robot OS”). Despite the name, ROS is not an operating system. It is a set of linux programs and libraries, providing a framework for easy development of robot “brains”. It has a number of useful ready-made modules and lets you add your own easily. There are modules for sensor access, visualization, basic image processing, localization and control for some of the popular robotic platforms. In addition, ROS provides a well-designed system for establishing asynchronous communications between the various modules: each module can run in a separate process and publish events in a “topic”, to which other modules may dynamically “subscribe”. Note that such an asynchronous system is different from the simpler Telliskivi approach. As you could hopefully understand from the descriptions above, in the Telliskivi solution, the various parts are fairly strictly structured. They all run in a single process, and operate in a mostly synchronized fashion. 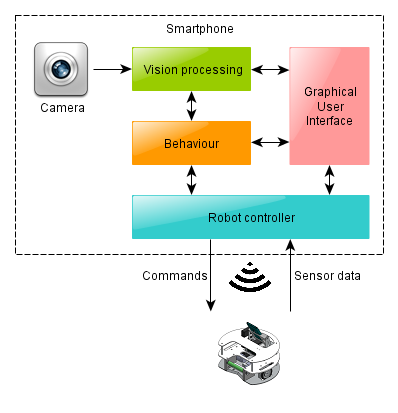 That is, every camera frame triggers the behaviour module, which, in turn, invokes the vision processing and sends commands to the robot controller. The next frame will trigger the same procedure again, etc. This makes the whole system fairly easy to understand, develop and debug. For robots that are more complicated than Telliskivi in their set of sensors and behaviours, such a solution might not always be appropriate. Firstly, different sensors might supply their data at different rates. Secondly, having several CPU cores requires you to run the code in multiple parallel processes if you want to make good use of your computing power. Even for a simpler robot, using ROS may be very convenient. In fact, several Robotex teams did use it quite successfully. In any case, though, independently of whether the robot’s modules communicate in a synchronous or asynchronous mode, whether they are parts of a framework like ROS or simple custom-made C++ classes, whether they run on a laptop or a smartphone, the overall structure of a typical soccer robot’s brain will still be the one shown above. It will consist of the Vision Processor, the Behaviour Processor, the Robot Controller and the GUI. about 2000 lines of QML code for the smartphone UI elements. By now we have completed the series of posts describing the “hardware” of our robot. Here is what we have covered. If there is anything regarding the hardware of the robot that should be explained in more detail – feel free to ask in the comments. 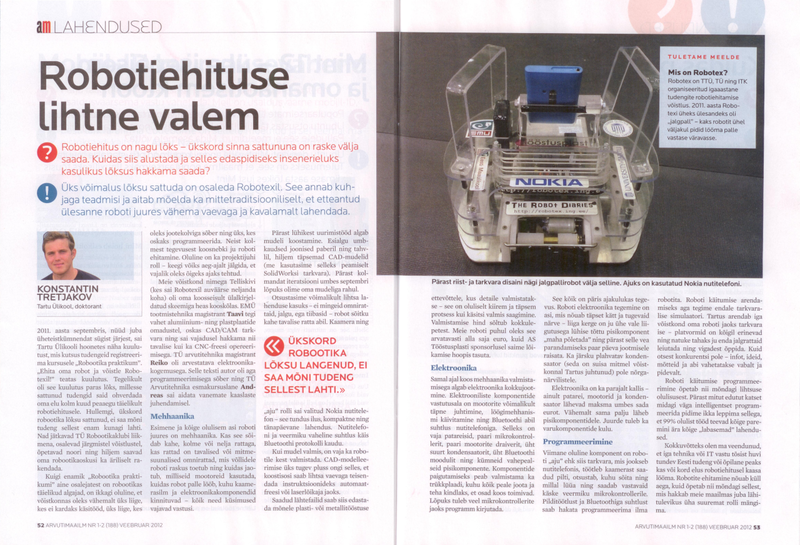 In some things, such as the smartphone and CNC manufacturing we got help from the sponsors (Nokia, Tööstusplast, Tartu University Institute of Technology and the Robotics club of the University of Tartu). Thus, we spent less than the nominal price. For other things, we spent more either because we bought back-up items (you never know when something is going to burn so this is always a good idea) or because we did not know exactly which particular option we would need and had to try different options. I might have forgotten or left out something, but the table below should give a reasonable impression of a minimal expense sheet for a robot like Telliskivi. The prices are in euros. Wheels, wheel mounting hubs, motor mounting brackets 15 49.70 In the end we did not use the wheels nor the motor brackets. We did need two sets of wheel tires and mounting hubs. Sheet plastic and CNC cutting 50 14.07 Tööstusplast sponsored most of the manufacturing. The “nominal price” is an optimistic guess. Sheet aluminium and laser cutting 50 7.75 Metec sponsored most of the manufacturing. The “nominal price” is an optimistic guess. The “we paid” price includes the price for restoring a lathe and a drill broken by us. Let me summarize this to those of you not interested in detailed numbers. If you are willing to make a similar robot, be prepared to spend at least 400 euros. Out of those, you will spend about 100 on raw materials and manufacturing, 100 on microcontrollers and PCBs, 100 on “large” components (motors, capacitors, battery) and 100 on all kinds of nuts, bolts, connectors and wires. If you plan to order stuff from abroad, prepare another 100 for shipping and taxes. You might easily end up spending at least twice the nominal amount on some articles either for experimenting or for safeguarding against failures on the last moment. This can double your numbers up to 1000 euros. If you now include expenses on junkfood, transport and the sleepless nights spent by the four team members making and programming the robot, you’ll see that participation in Robotex is, in fact, a very expensive project (for a student, at least). But it’s worth it none the less!